One of the world's top climate scientists has calculated that emissions from Alberta's oilsands are unlikely to make a big difference to global warming and that the real threat to the planet comes from burning coal. 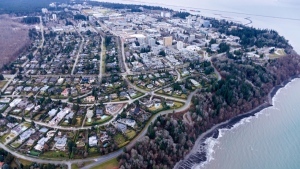 "I was surprised by the results of our analysis," said Andrew Weaver, a University of Victoria climate modeller, who has been a lead author on two reports from the United Nations Intergovernmental Panel on Climate Change. "I thought it was larger than it was." They found that if all the hydrocarbons in the oilsands were mined and consumed, the carbon dioxide released would raise global temperatures by about .36 degrees C. That's about half the total amount of warming over the last century. In contrast, the paper concludes that burning all the globe's vast coal deposits would create a 15-degree increase in temperature. Burning all the abundant natural gas would warm the planet by more than three degrees. "The conventional and unconventional oil is not the problem with global warming," Weaver said. "The problem is coal and unconventional natural gas." He said his analysis suggests it is an increased dependence on coal -- not the oilsands -- that governments have to worry about. As well, there's so much gas in the world that it will also cause problems despite the fact it emits less carbon than oil. "One might argue that the best strategy one might take is to use our oil reserves wisely, but at the same time use them in a way that weans us of our dependence on coal and natural gas," Weaver said. "As we become more and more dependent on these massive reserves, we're less and less likely to wean ourselves away from them." "We've heard a lot about how if we burn all the oil in the tarsands it's going to lead to this, that and the other. We thought, 'Well, let's take a look at this. What is the warming potential of this area?' and the numbers are what they are." "This idea that we're going to somehow run out of coal and natural gas and fossil fuels is really misplaced. We'll run out of human ability to live on the planet long before we run out of them. "I have always said that the tarsands are a symptom of a very big problem. The problem is dependence on fossil fuels."